It consists of an av transmitter and a receiver. The transmission range is up to 300m / 984ft. Use 5.8GHz ISM frequency band. 300m / 984ft transmission range without any holdback. Fully compatible with various resolution HDMI input and output devices. Through its own infrared receiver and transmitter lengthener, it can reverse-transmit the standard 38KHz frequency infrared radio frequency. Model: HD585. Transmission frequency: 5.8GHz. HDMI interface with the highest resolution supporting 1080@60Hz. 5 GHZ 30 M. Fréquence de Transmission 5 GHz. Solution HDTV sans fil pour profiter d'une image et d'un son HDTV sans câble. Entrée de connexions 1x HDMI®. Sortie de connexions 2x HDMI. • Transmission jusqu'à 30 m (ligne de vue) pour une connexion sans fil longue distance. 5 GHZ 100 M. Solution HDTV sans fil professionnelle pour profiter d'une image et d'un son HDTV sans câble, jusqu'à une distance de 100 mètres (visibilité directe). Fréquence 5 GHz. Fréquence de Transmission 5 GHz. It consists of an av transmitter and a receiver. The transmission range is up to 300m / 984ft. Use 5.8GHz ISM frequency band. 300m / 984ft transmission range without any holdback. 1 x IR Extender Wire. Ils sont connectés à la Média Box qui communique sans fil avec votre TV LG. (Lecteur Blu-Ray, Box internet, etc. LCD > 32" : Séries LX9500 / LX6500 / LE8500 /. ). Les signaux audio et vidéo peuvent être transmis au récepteur sans fil et affichés sur le téléviseur. Digital 2.4G & 5GHz dual frequency wireless A/V transmission, high transmission rate and strong anti-interference capability. Wireless Band:2.4GHz, 5GHz ISM Band. 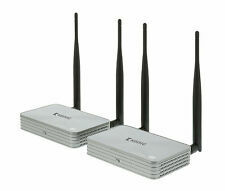 This product will let the user experience of transmitting the HD content by wireless. Interface HDMI avec la plus haute résolution soutenant 1080@60Hz. Interface d'entrée: HDMI. Conception de matériel complet, pas besoin d’installer le logiciel, sans fil tous les réglages, plug-and-play. HDMI interface, the highest resolution supports 1080@60Hz. Input and output port: HDMI. If you do not receive our reply within 48 hours, pls. If you are satisfied with our service, pls. 1 Connecting Cable. The powerful, high-speed digital signal won't interfere with etooth, WiFi, or any other wirel network. This is a product: Wireless Video Hdmi Transmitter & Receiver For Streaming Hd 1080P 3D Video. Transmitted signal is crystal clear, able to stream uncompred HD video & o with ease. The Nyrius ARIES Pro Transmitter (NPCS600) allows you to unchain your HDMI device from your TV in razor sharp, uncompressed 1080p 3D video - it's like an invisible HDMI cable. The Internet is an abundant source of movies and videos and with ARIES Pro you can stream it to your TV wirelessly. Take ntrol of your HD video and wirelessly stream to the screen of your choice. The Nyrius ARIES Pro Transmitter (NPCS600) allows you to unchain your HDMI device from your TV in razor sharp, unmpressed 1080p 3D video - it's like an invisible HDMI cable. The powerful digital signal won't interfere with Bluetooth, WiFi, or any other wireless network, so you're free to arrange your living room your way, without being a slave to your audio/video devices. Through its own infrared receiver and transmitter lengthener, it can reverse-transmit the standard 38KHz frequency infrared radio frequency. New dual antenna design, no need to adjust the antenna angle, 360 degree omnidirectional dead-angle reception, stronger signal, better reception effect. HDMI interface, the highest resolution supports 1080@60Hz. New dual-antenna design eliminates the need to adjust the antenna angle, 360-degree omnidirectional reception. Input and output port: HDMI. Working in the uncrowded 60 GHz frequency band, it is not subject to interference by WiFi signals, microwave radiation, or cordless phone. Resolution: Up to 1080P @60Hz. 1: Connect the HD source to the input of the wireless extender TX with 1HDMI cable. New dual antenna design, no need to adjust the antenna angle, 360 degree omnidirectional dead-angle reception, stronger signal, better reception effect. Through its own infrared receiver and transmitter lengthener, it can reverse-transmit the standard 38KHz frequency infrared radio frequency. Wireless transmission band: 2.4GHz/ 5GHz ISM Band. HDMI output cable length: ≤12m AWG26 HDMI standard line. Included: 1 x Wireless HDMI Transmitter. Supported HDMI audio format: LPCM2.0. Maximum HDMI transmission bandwidth: 225MHz. New dual-antenna design eliminates the need to adjust the antenna angle, 360-degree omnidirectional reception. HDMI interface, the highest resolution supports 1080@60Hz. 1 Transmitter. Input and output port: HDMI. W2H mini wireless HDMI transmitter/receiver, applies wireless HD technology, working in the uncompressed 60 GHz frequency band, which supports the highest resolution up to 1080p@60Hz at wireless transmitting distance of up to 30m. Including a transmitter and a receiver in this product. - 1 x Transmitter. - Applications: you can connect the receiver with monitors like TV, projector. - HDMI 1080 output. - HDMI Input. - 1 x HDMI Cable. 165' Feet (50m) Wireless HDMI IR Extender Transmitter Receiver Kit. It has strong anti-interference ability by running at 5GHz operation frequency and supports point to point connection. Operation Frequency: 5GHz. Through its own infrared receiver and transmitter lengthener, it can reverse-transmit the standard 38KHz frequency infrared radio frequency. Model: HD585. New dual antenna design, no need to adjust the antenna angle, 360 degree omnidirectional dead-angle reception, stronger signal, better reception effect. Working in the uncrowded 60 GHz frequency band, it is not subject to interference by WiFi signals, microwave radiation, or cordless phone. 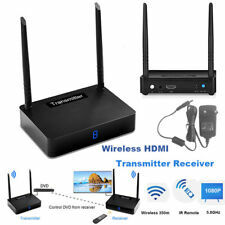 Signal Transmission Wireless HDMI Extender 3D Transmitter Receiver Video/Audio S.
Transmission distance: 450M. HDMI interface, the highest resolution supports 1080@60Hz. New dual-antenna design eliminates the need to adjust the antenna angle, 360-degree omnidirectional reception. The product consists of transmitter and receiver and can wireless transmit HDMI high-definition signals to receiver end,The transmitter supports one HDMI signal input,and one HDMI signal output enables the signal terminal to watch video simultaneously. International 2.4G/5G wireless dual-band transmission signal, faster transmission speed, stronger anti-interference,external dual-gain antenna, ultra-long transmission distance. Resolution is 1080P@60Hz and downward compatible with audio and video transmission, the wireless receiving image is clear and stable, colorful and high sound quality without noise.Support IR Remote controller to long range extend, can remote control signal source equipment at the receiver.